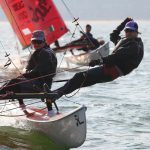 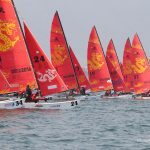 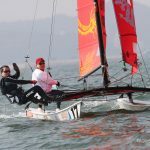 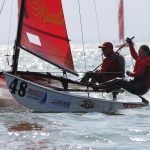 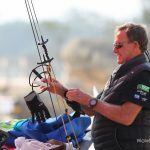 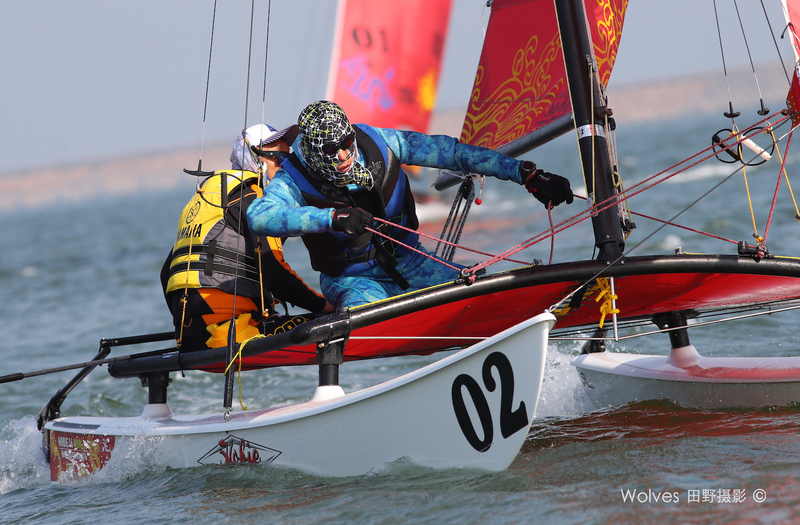 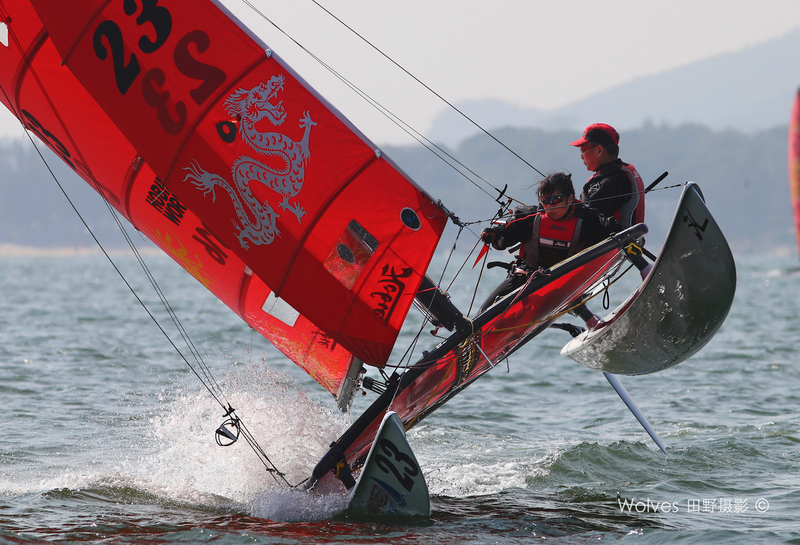 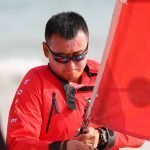 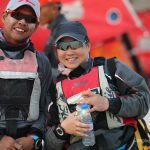 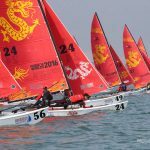 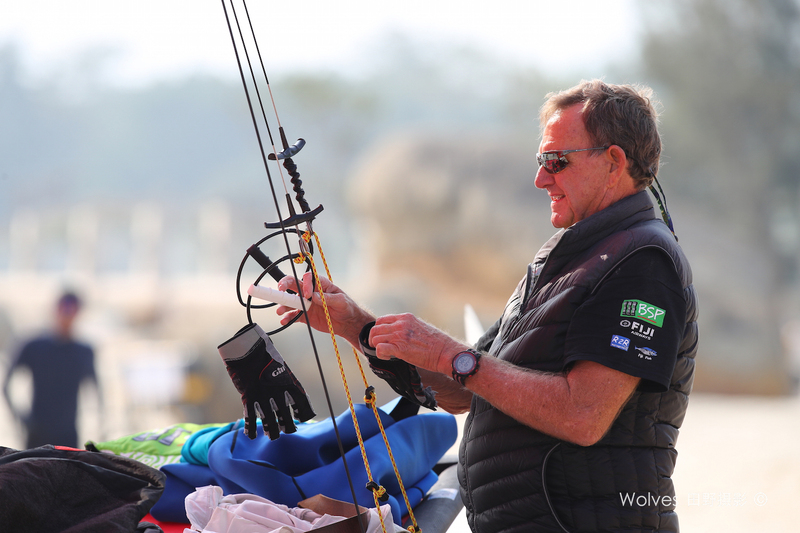 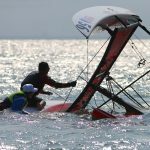 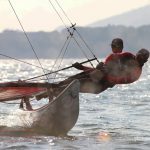 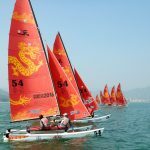 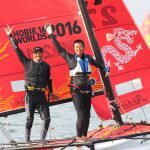 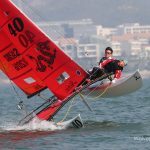 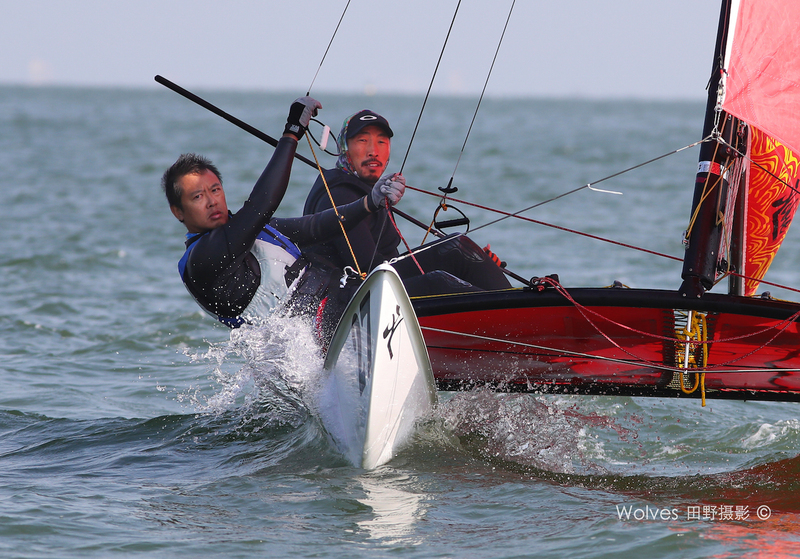 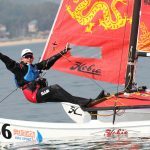 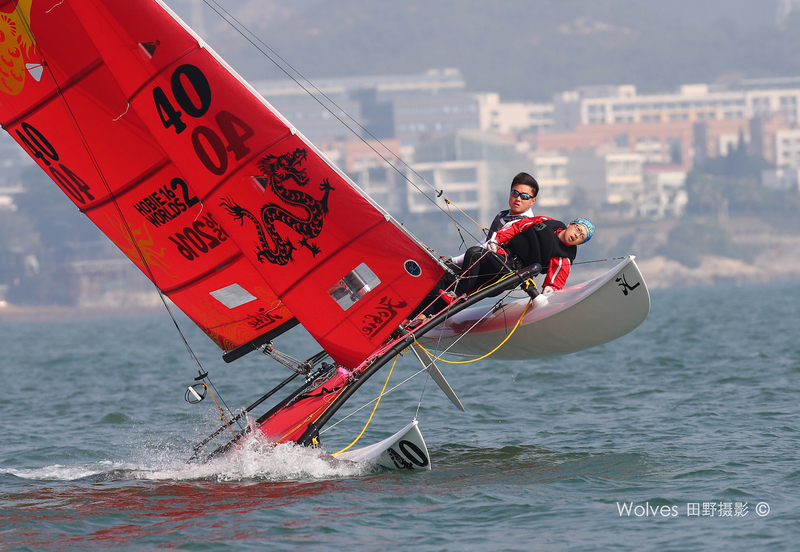 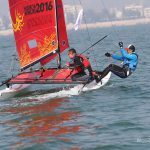 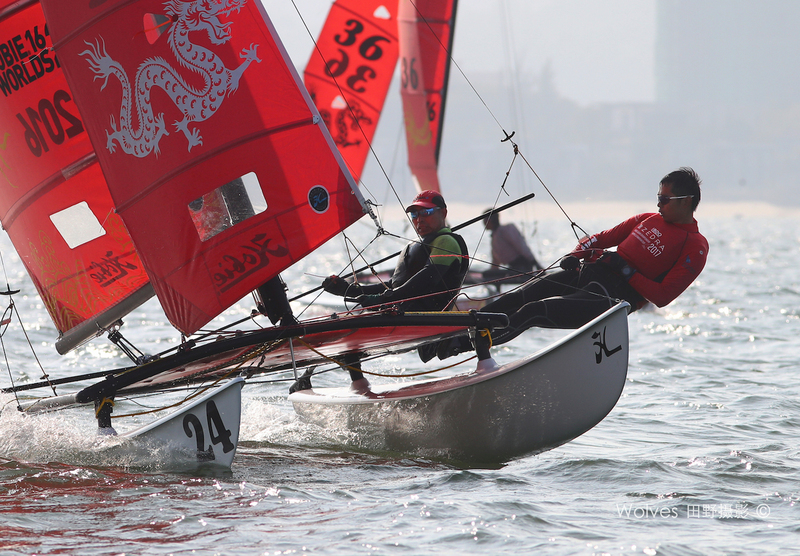 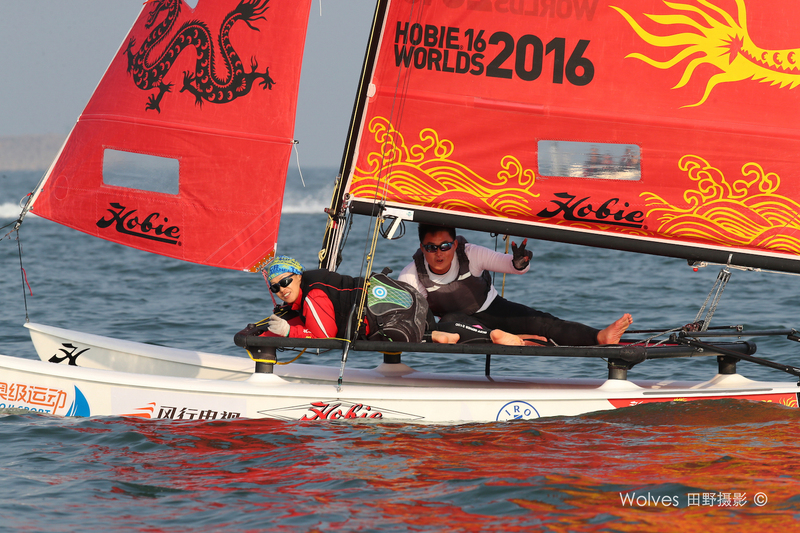 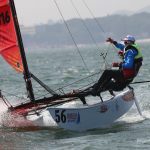 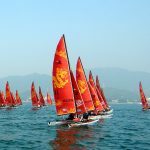 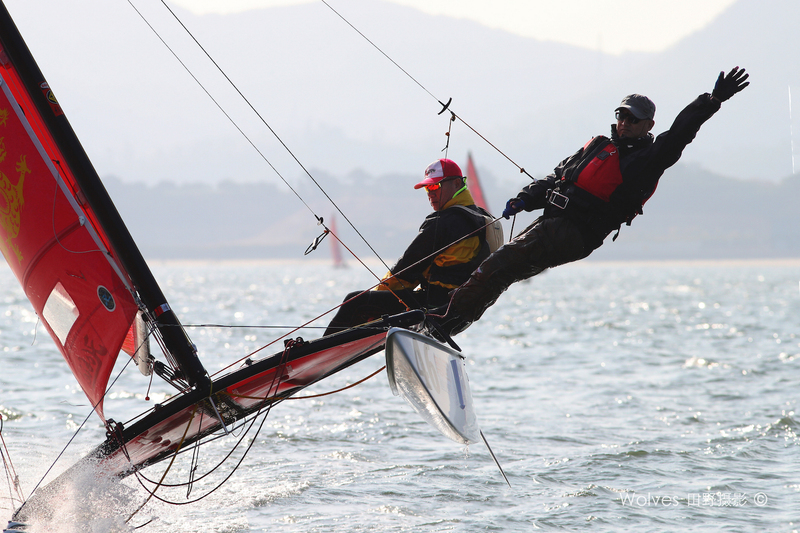 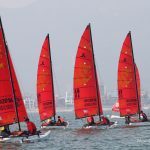 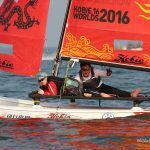 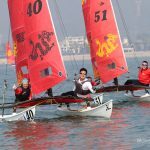 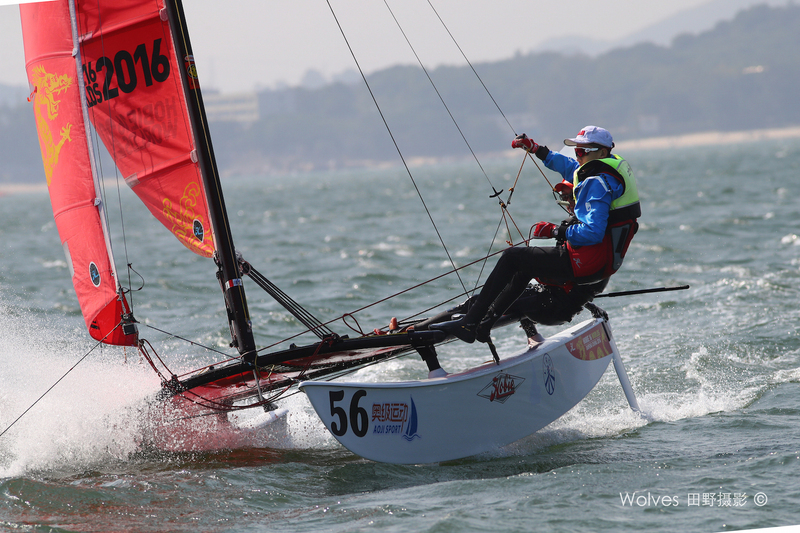 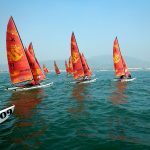 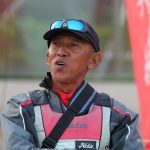 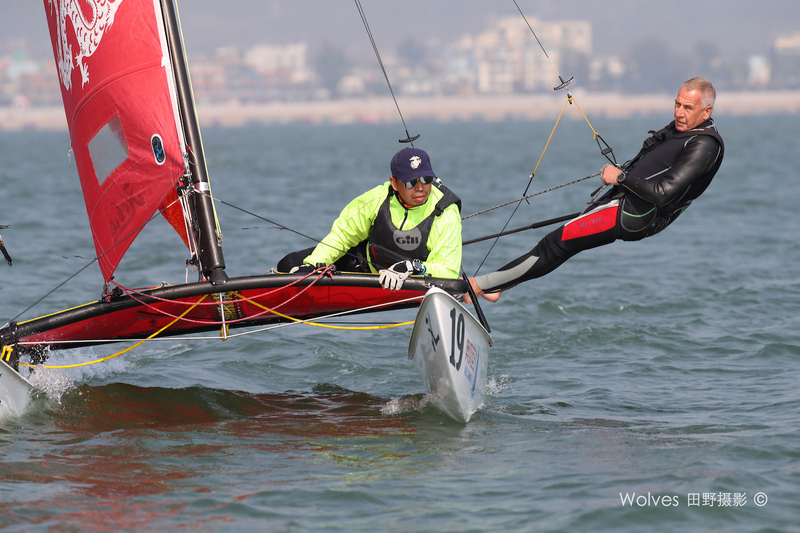 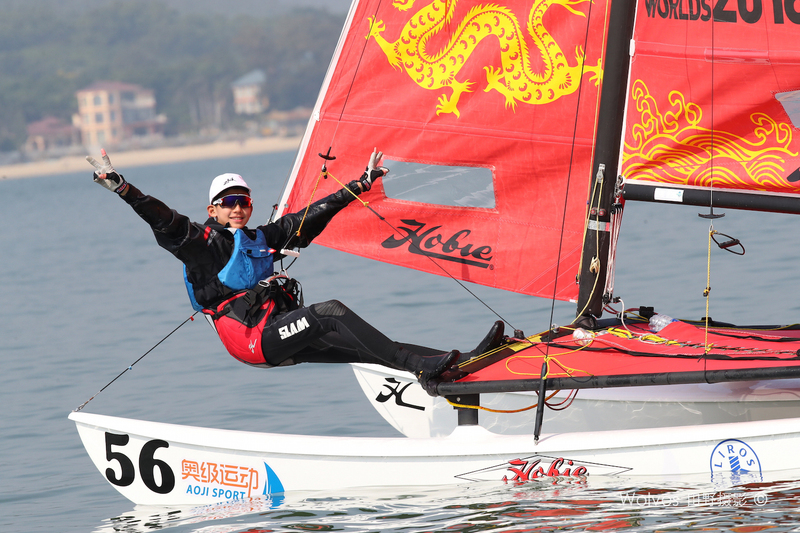 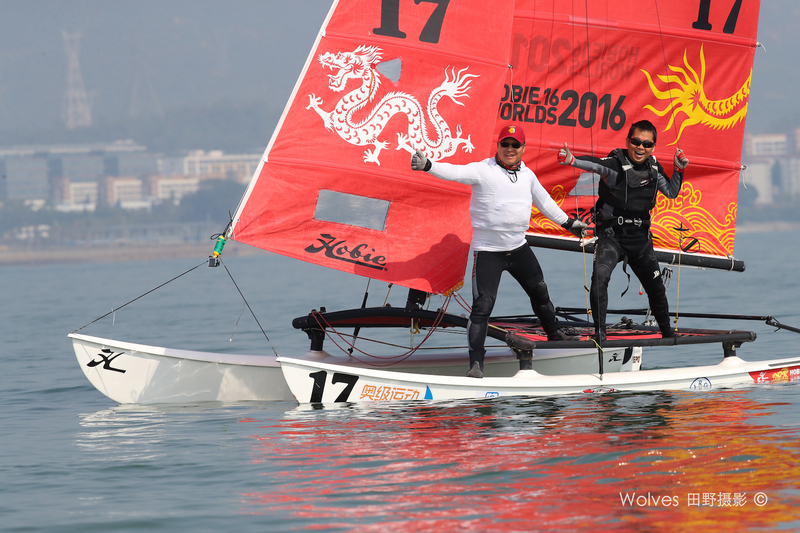 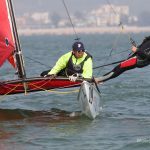 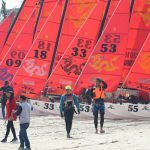 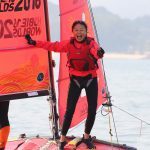 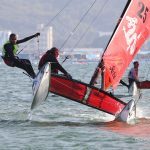 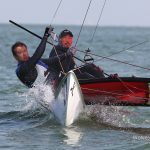 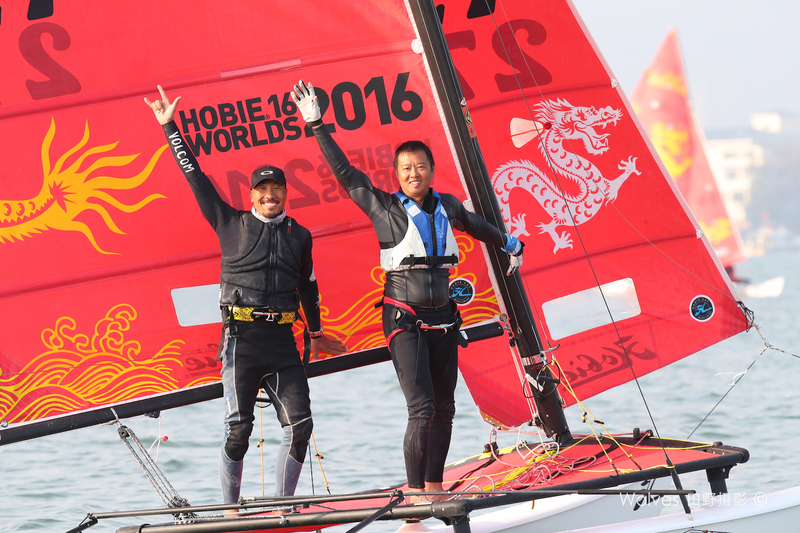 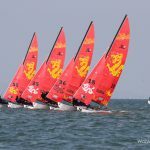 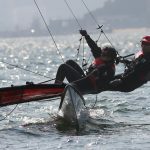 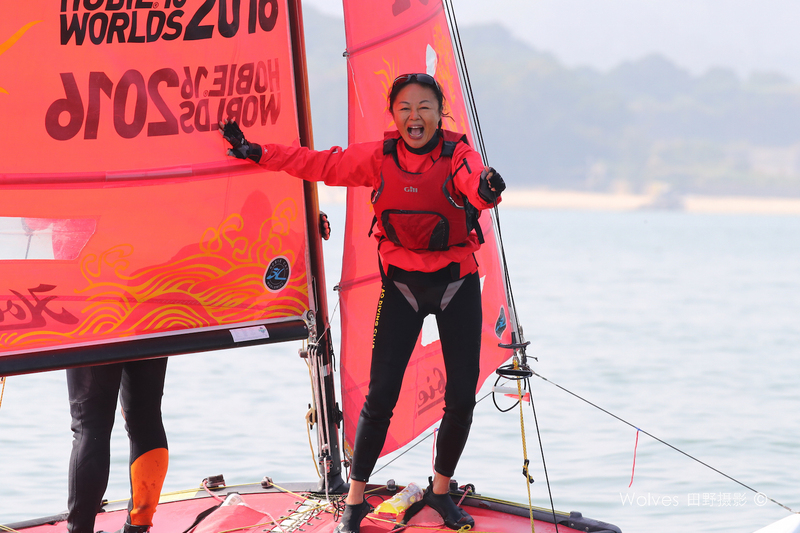 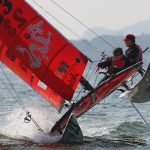 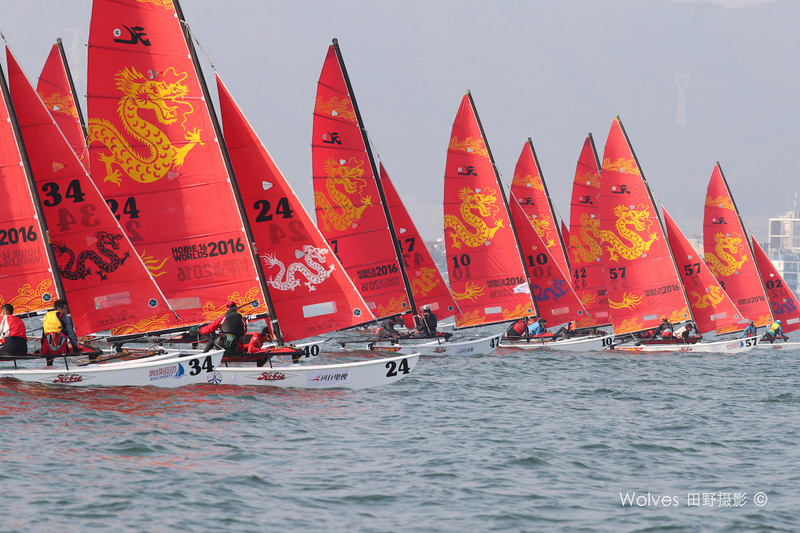 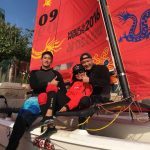 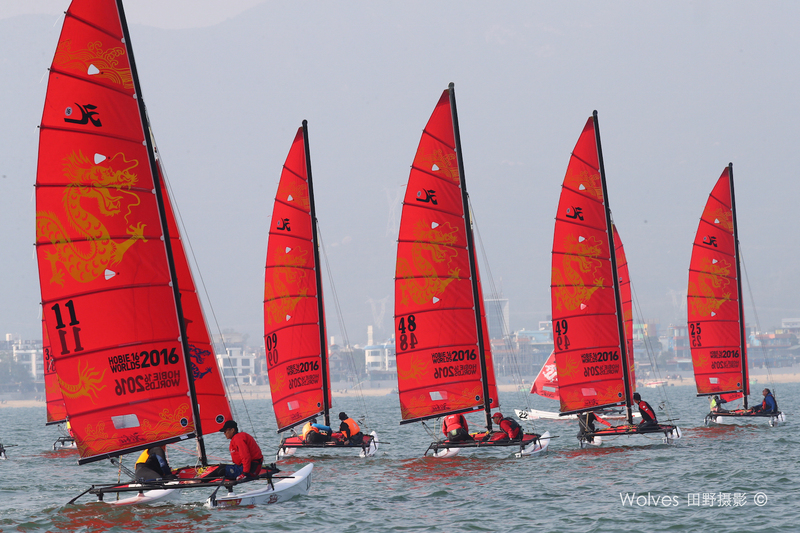 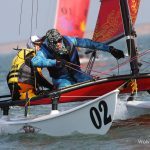 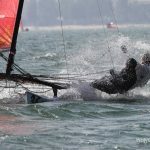 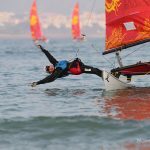 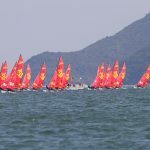 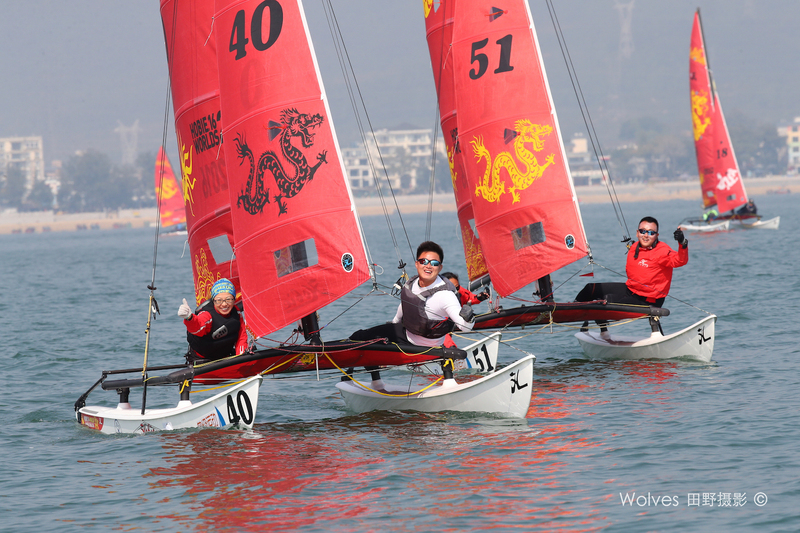 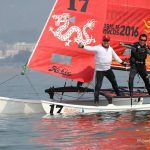 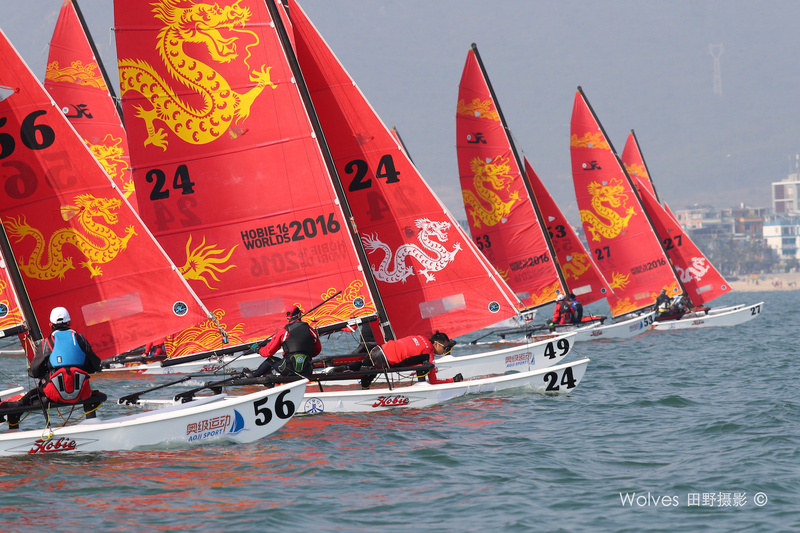 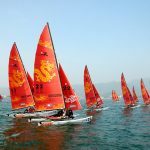 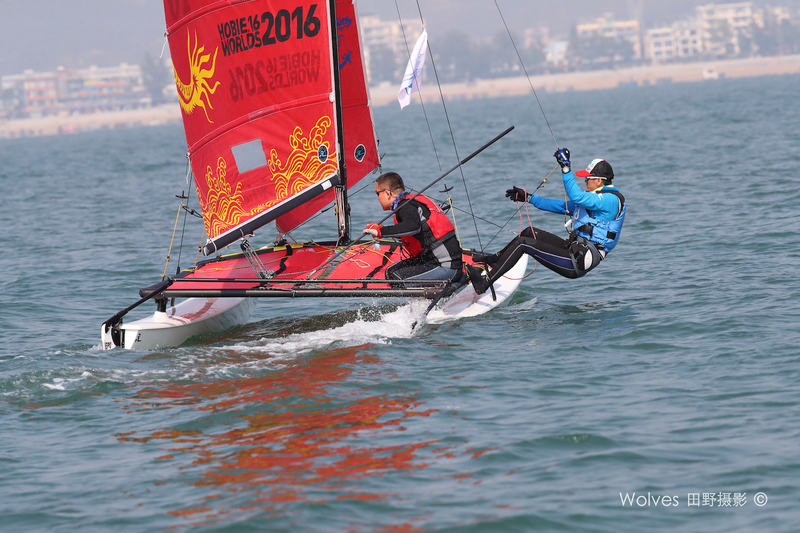 2017 Hobie Asian Championships opened with a bang! 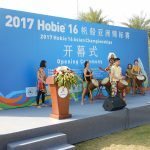 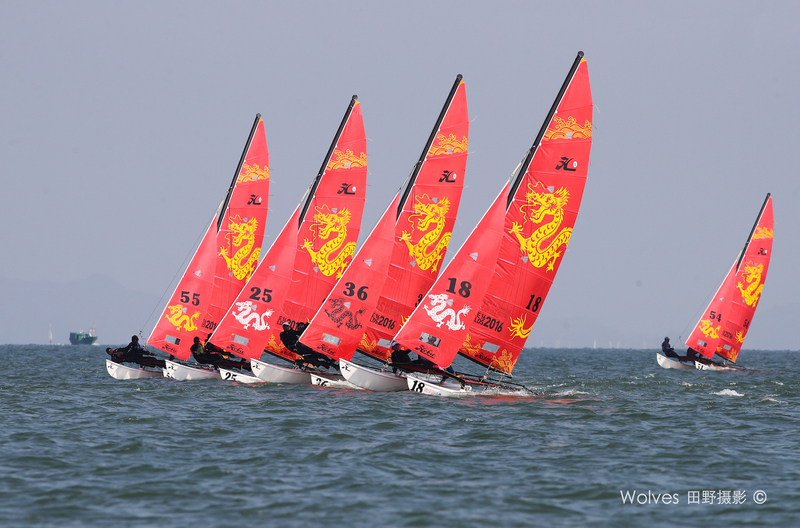 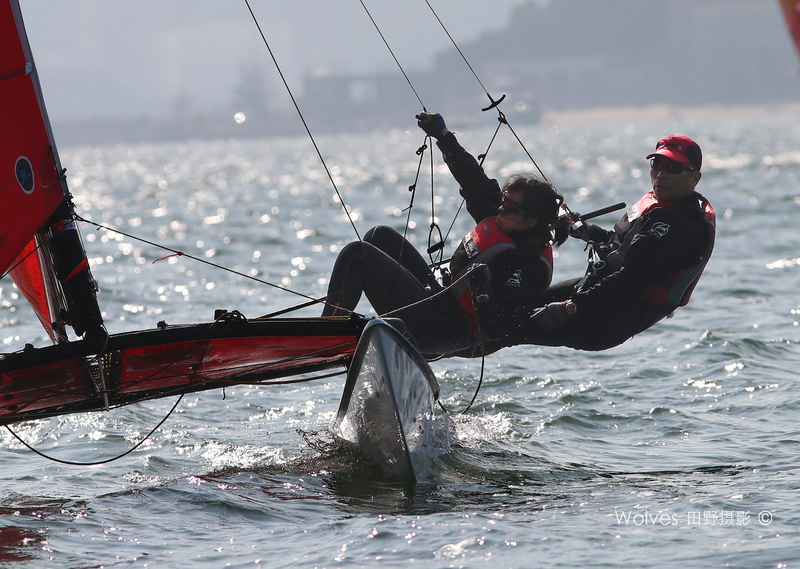 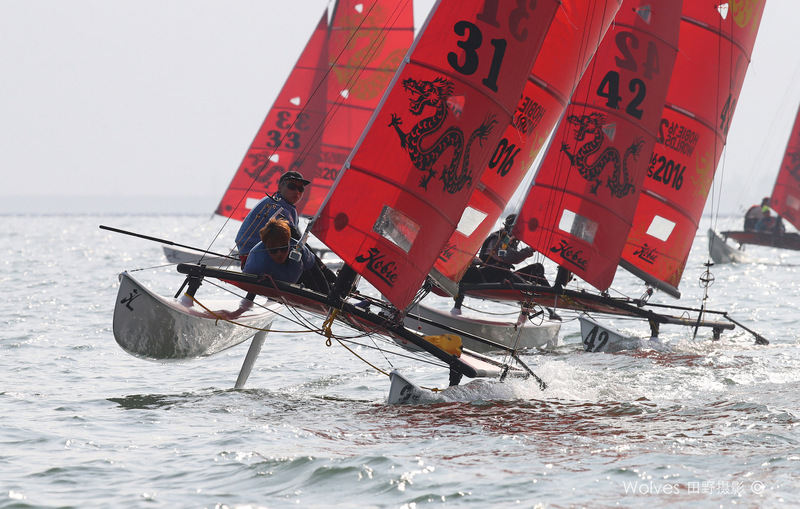 With 33 teams from 9 countries and 3 continents this was the largest Hobie Asian Championships in years. 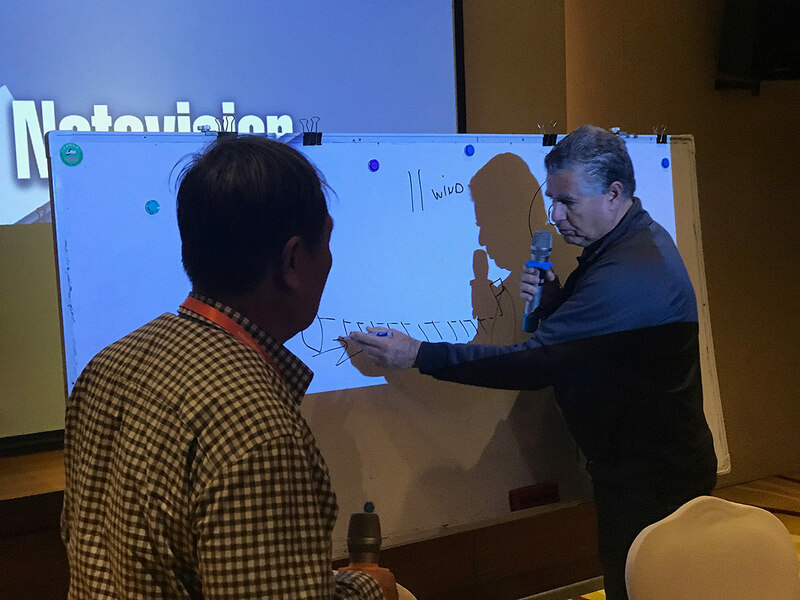 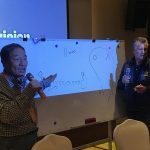 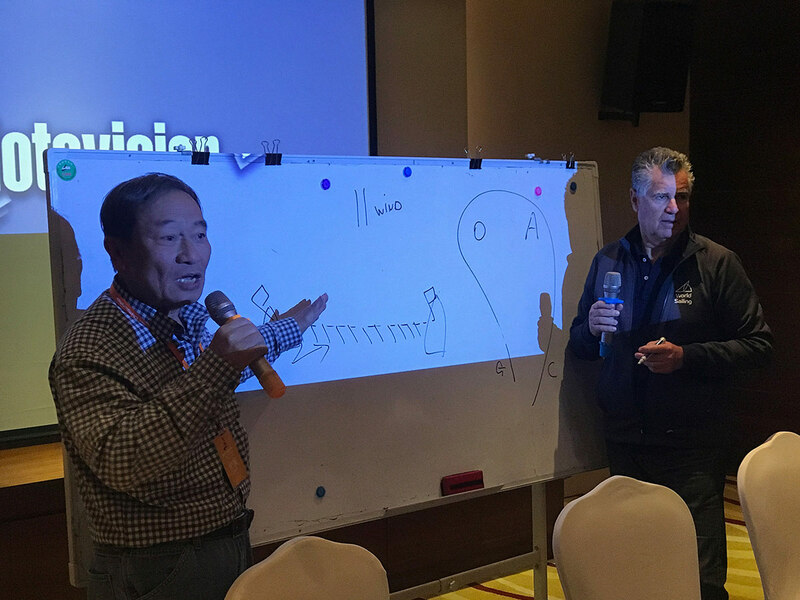 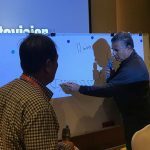 The Thursday night competitors meeting also gave the competitors a short rules discussion by the chairman of the jury, Nino Shmueli IJ, IRO and John Gu IJ. 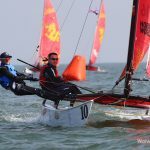 This was greatly appreciated by the sailors. 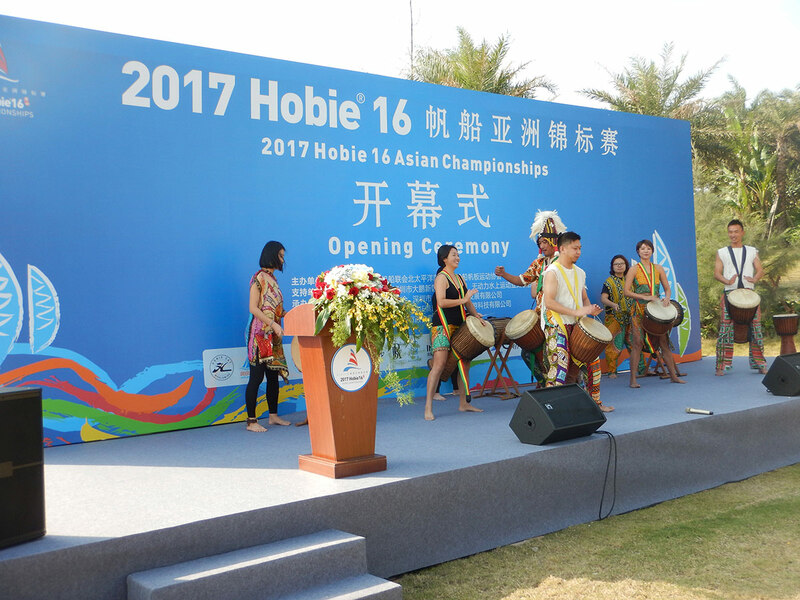 The Opening ceremony on Friday morning was some very short speeches followed by the traditional Chinses fireworks display . 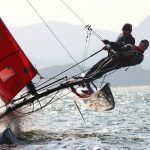 Though that was not the only big bang waiting for the sailors. 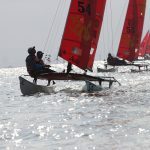 On the race course was the northerly monsoon waiting for the sailors. 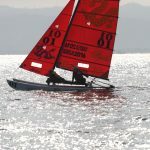 In flat water with wind gusting to nearly 20 knots it certainly tested the sailors. 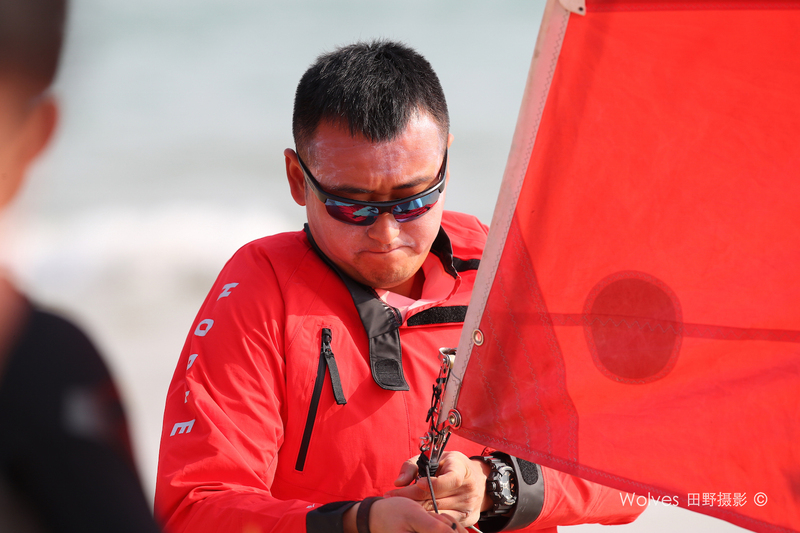 The strong wind tested all the sailors. 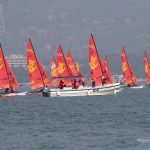 The sailors were greeted with lighter conditions, much to the relief of many of the sailors. 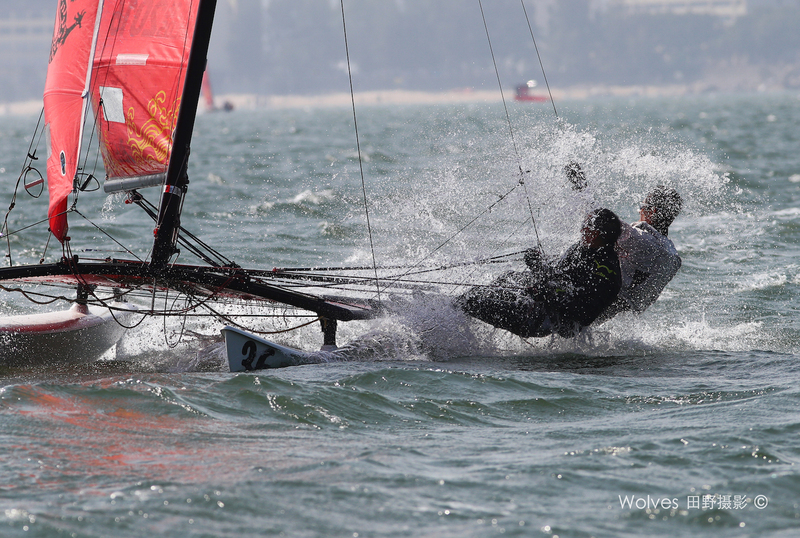 Yesterday left many sailors tired, sore and a few had their pride bruised. 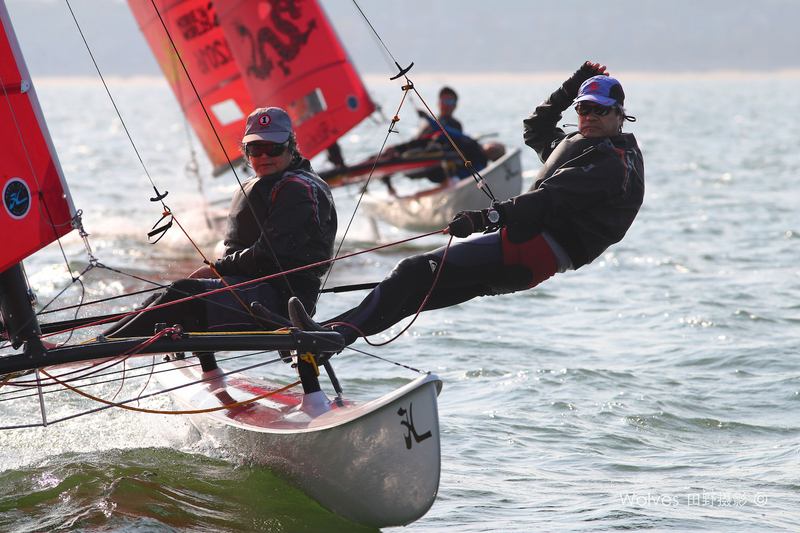 The first race was sailed in 8-12 knots from the East as the cooler front pushed the Northerly Monsoon away. 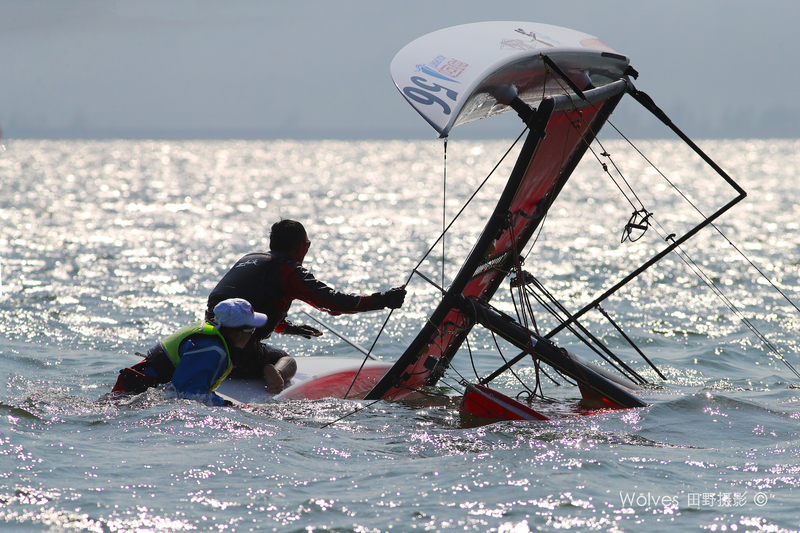 After the first race the Monsoon tried to fight a losing battle with cool front. 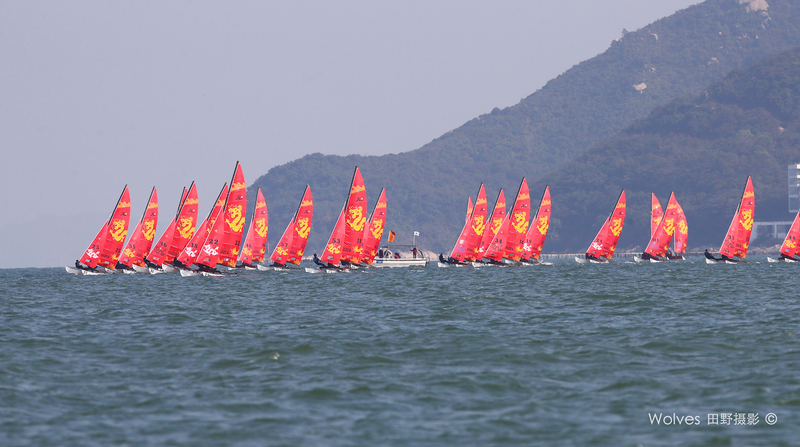 The race committee sent the sailors back to shore for a lunch. 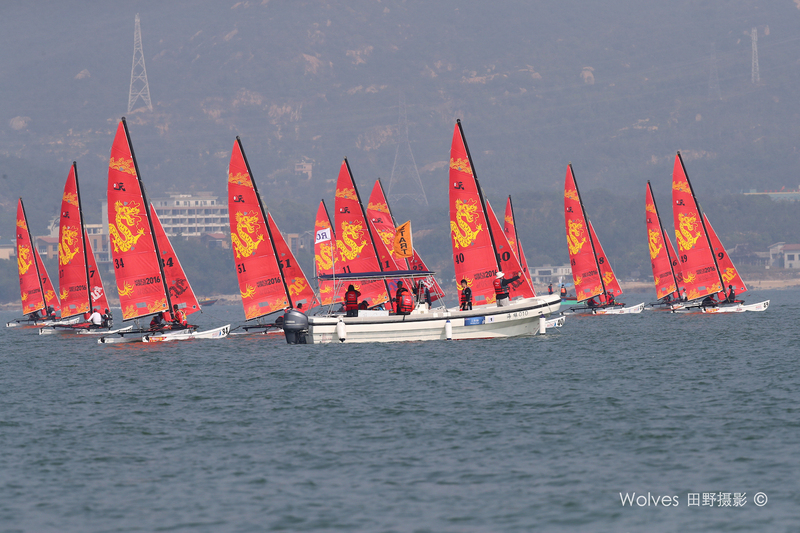 After the lunch break the cool front prevailed and 3 more races were run. 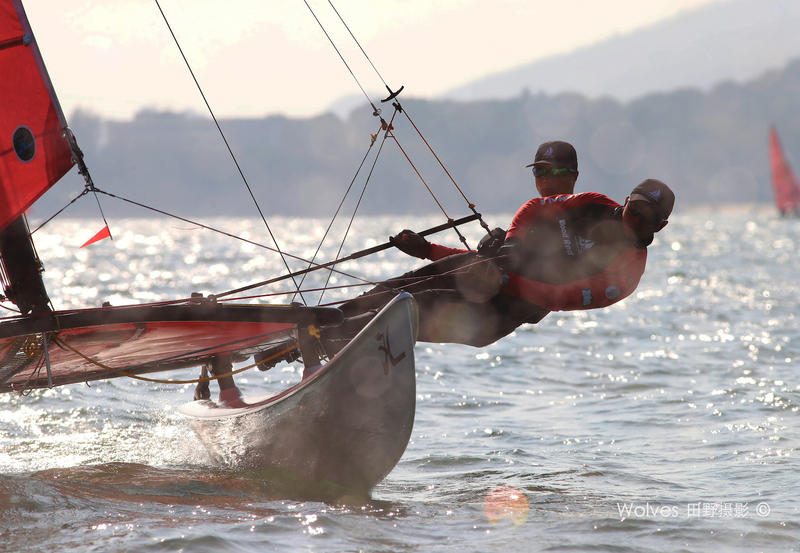 It seems Damrongsak and Aun Vongtim where unbeatable in these conditions. 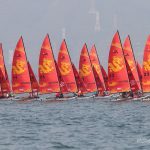 As they won all four races. 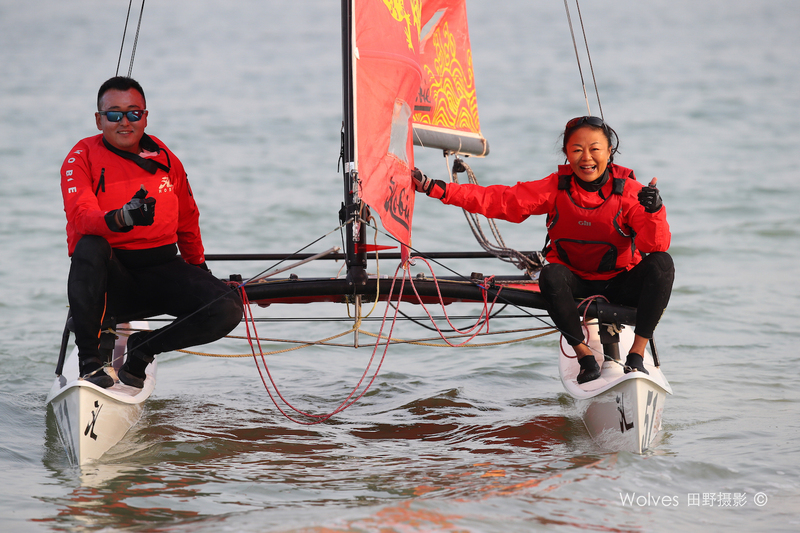 Teerapong Watiboonruang and Nutpatsorn did keep them honest in two of the races but some tactical errors also saw them slip out a Thai clean sweep in all four races.The big mover in the fleet was Graham Southwick and Josese Lullusago from Fiji who enjoyed the lighter conditions. 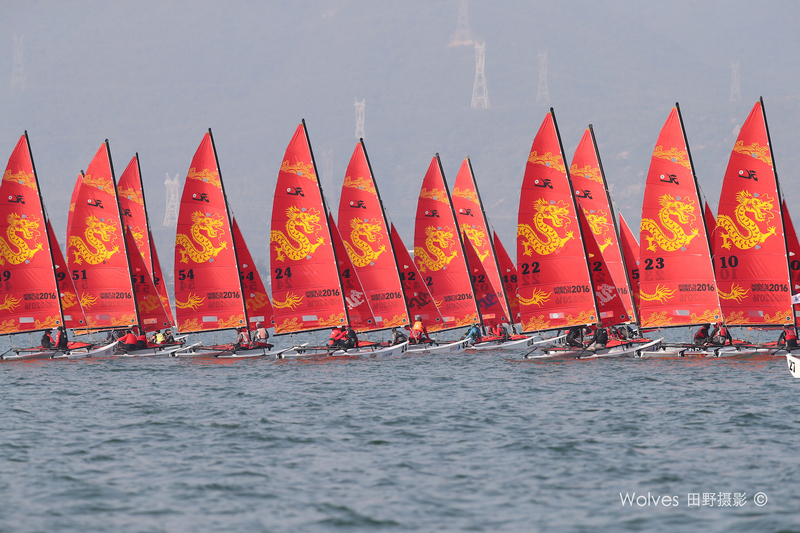 Racing continues tomorrow with the presentation after the final race. 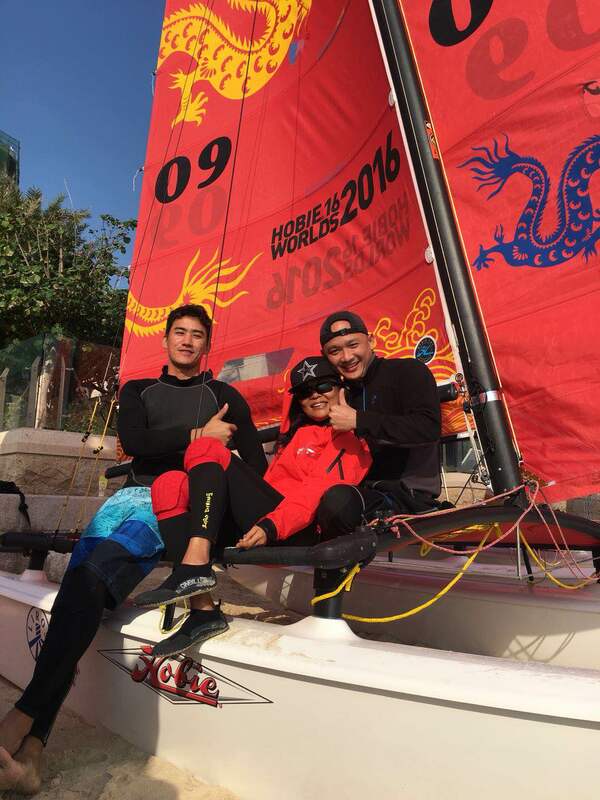 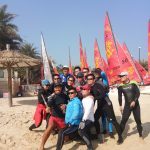 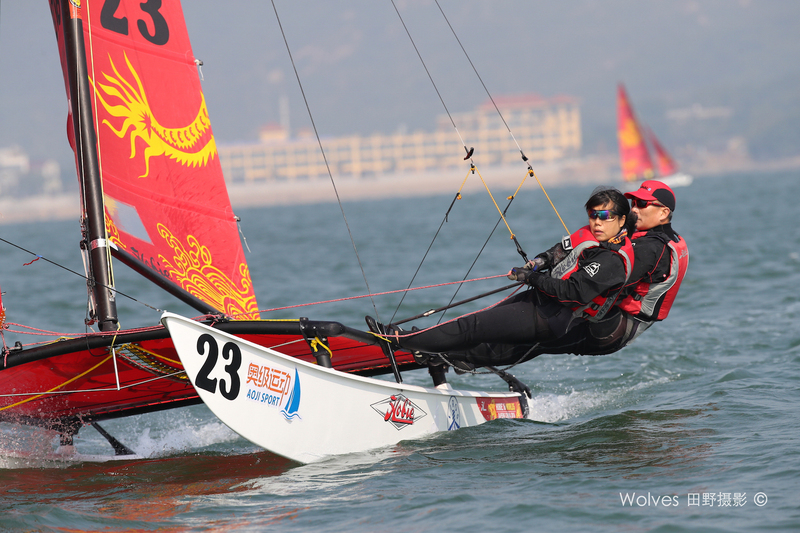 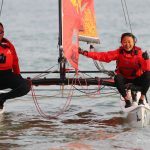 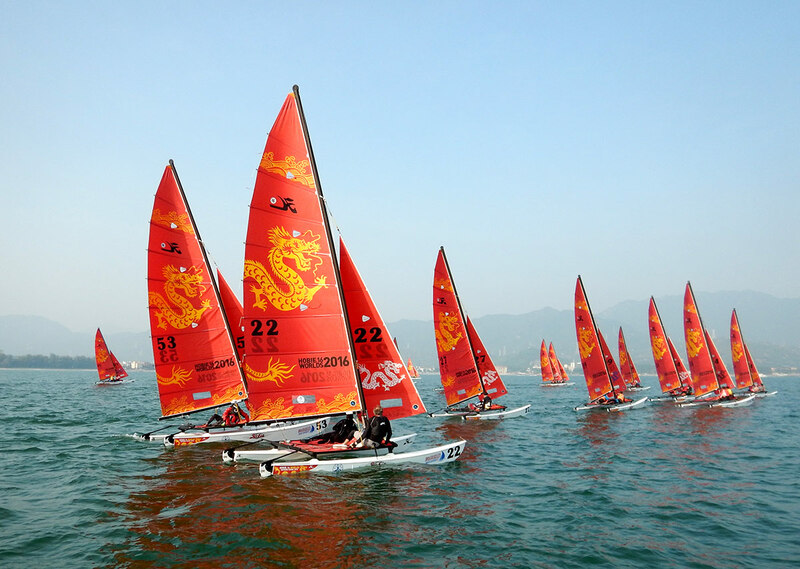 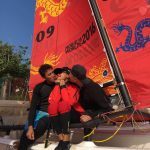 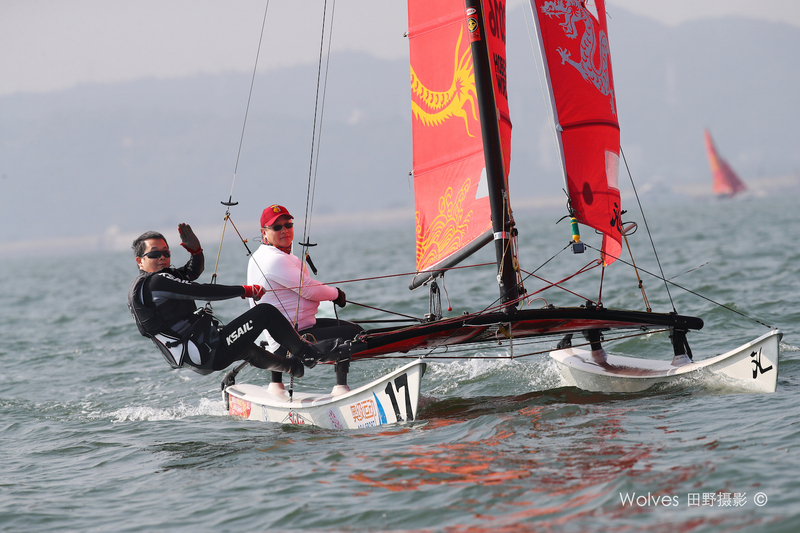 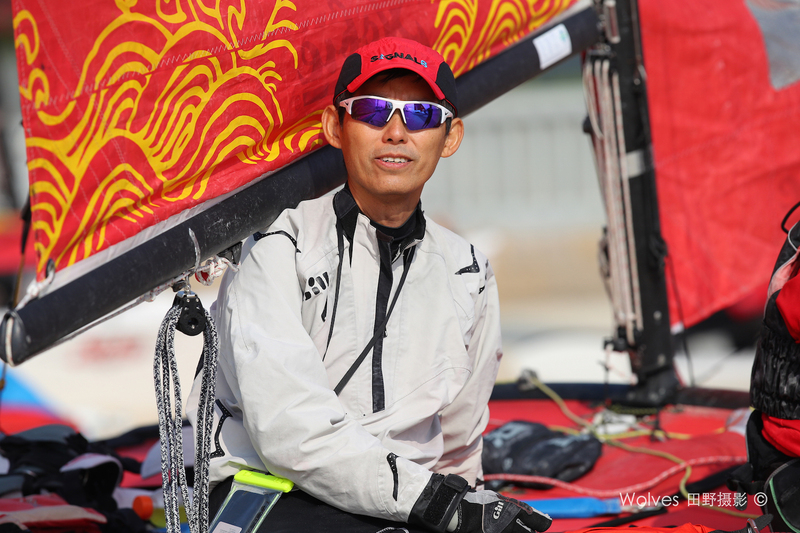 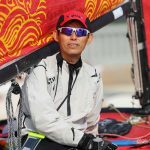 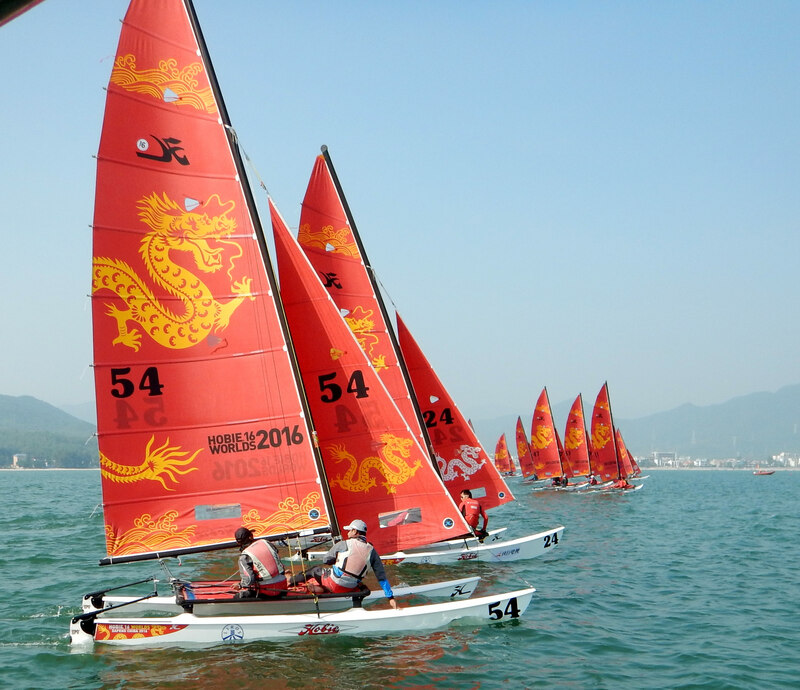 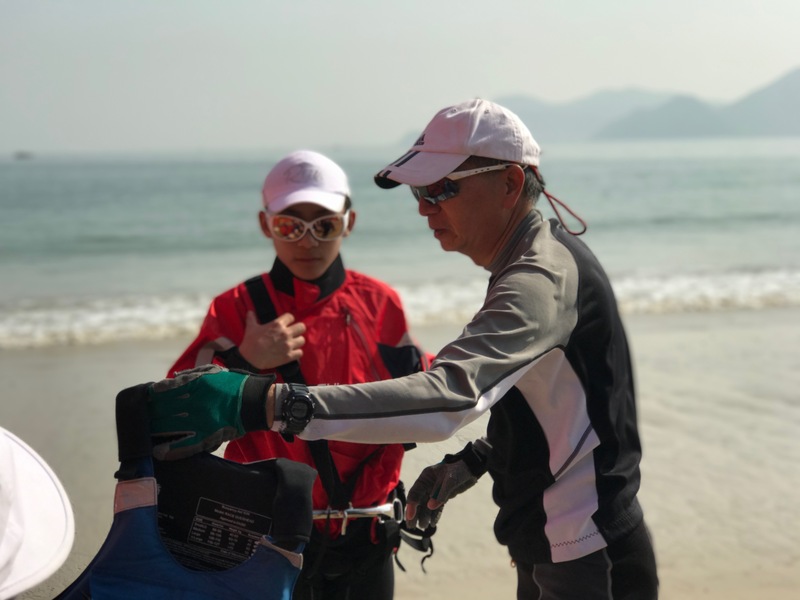 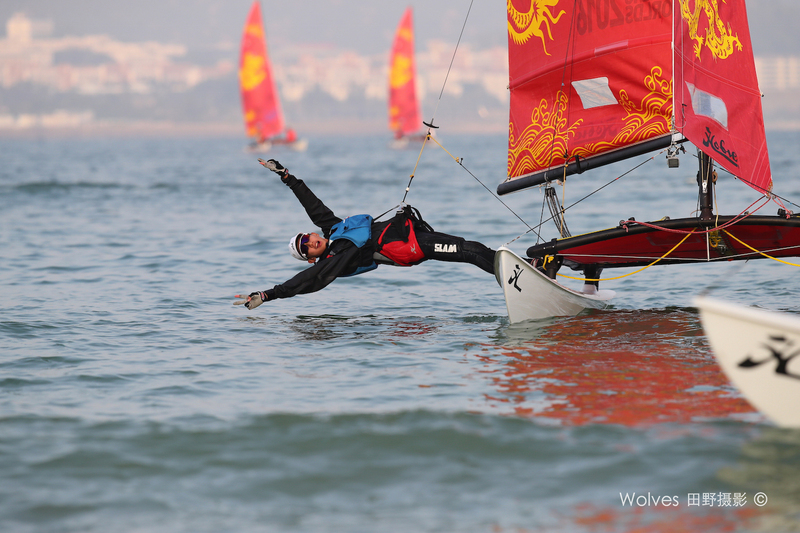 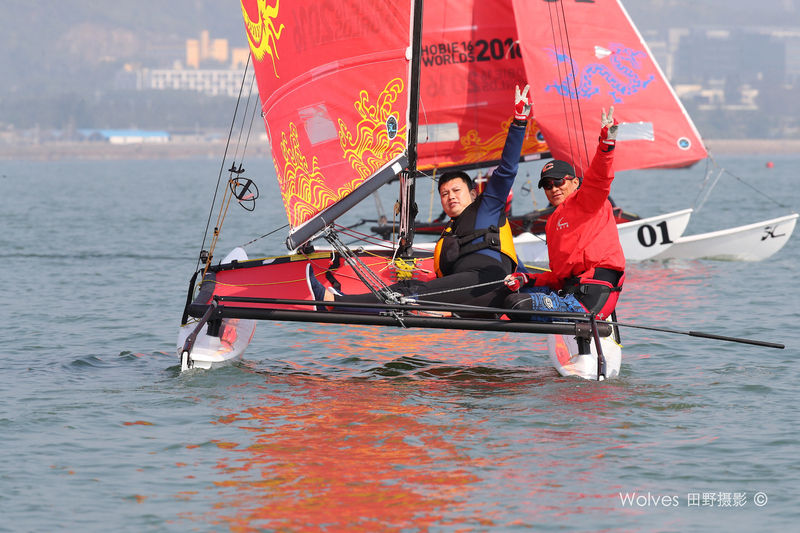 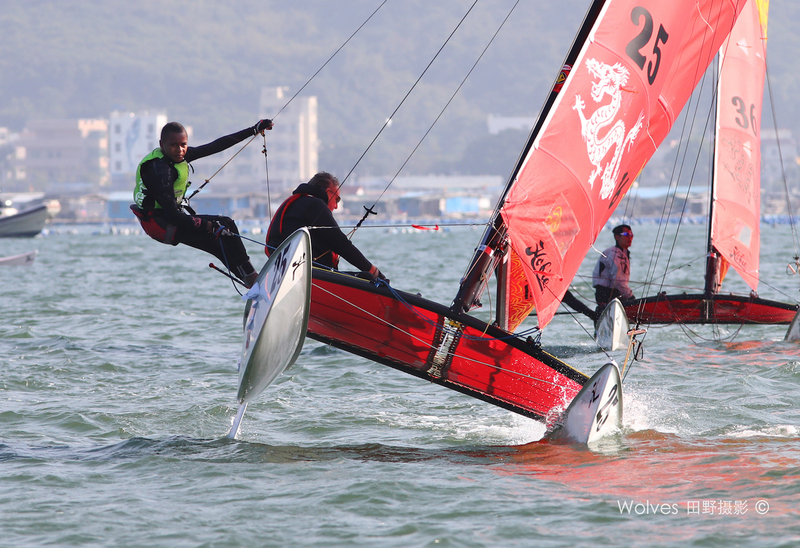 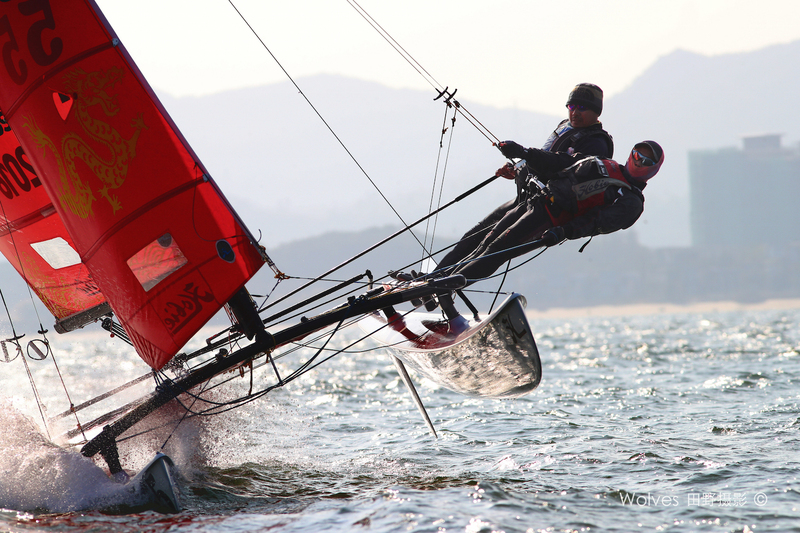 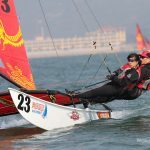 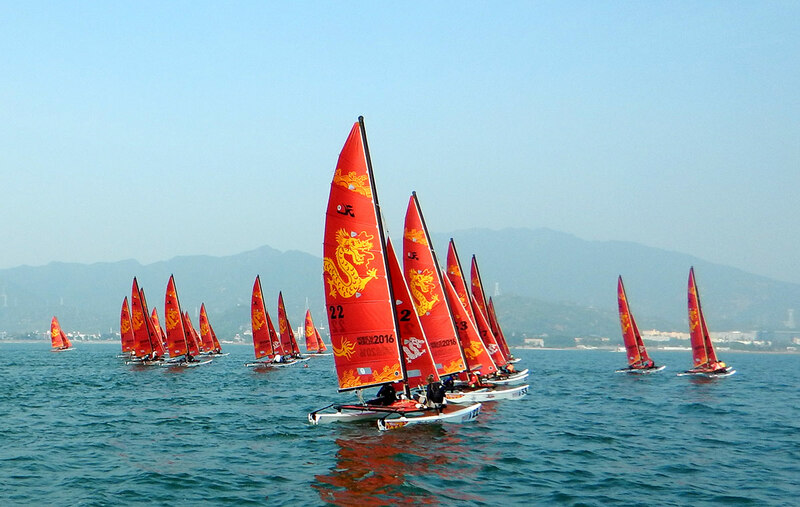 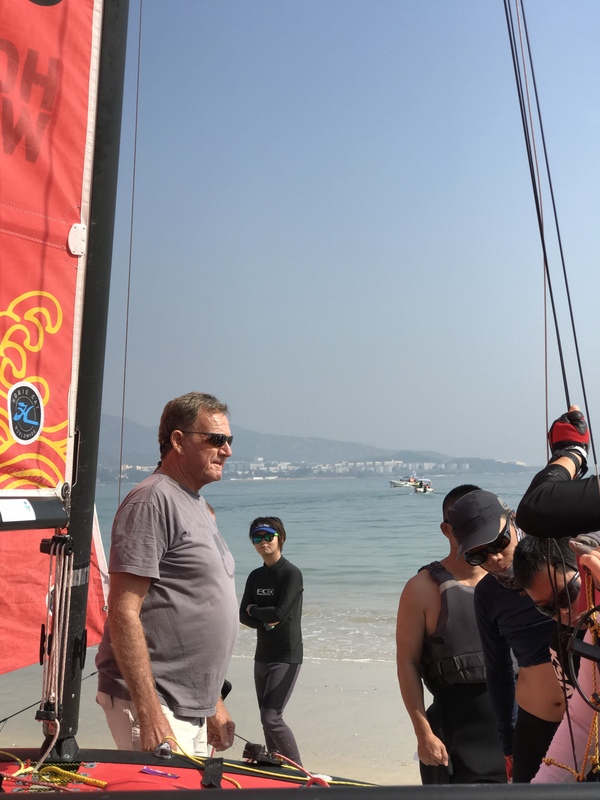 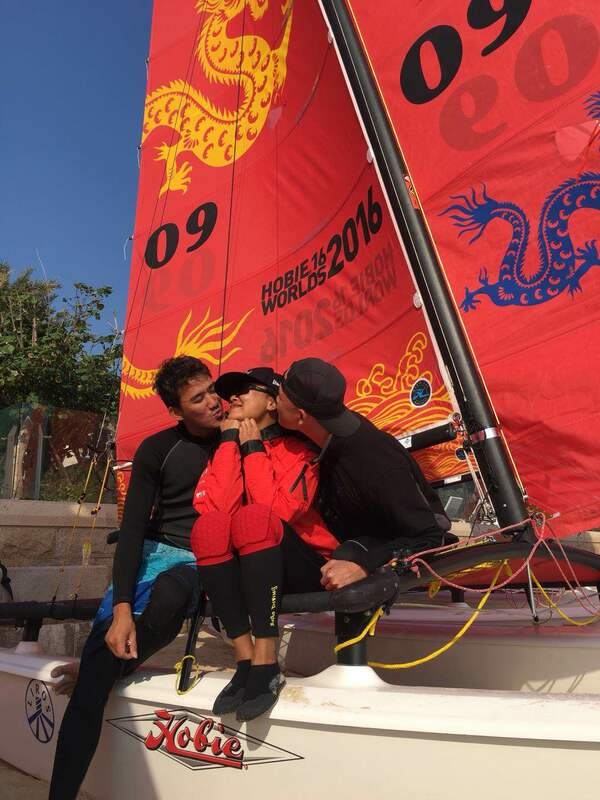 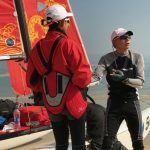 Once again Dapeng has turned on the weather and hospitality to the Hobie sailors. 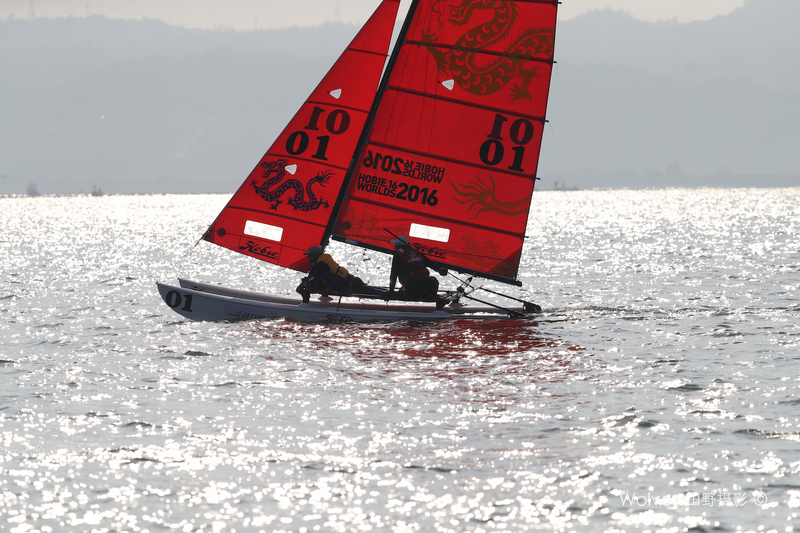 The cooler temperatures kept the northerly monsoon at bay for the morning. 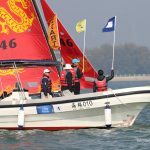 Though the sailors enjoyed the friendly atmosphere. 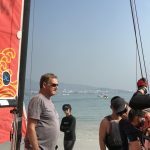 Some attended a boat rigging lesson from Great Grand Master Grahame ‘Fish’ Southwick. 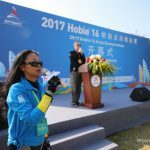 He kept the crowd entertained with his talk. 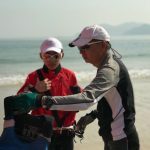 They greatly appreciated Grahame sharing his knowledge. 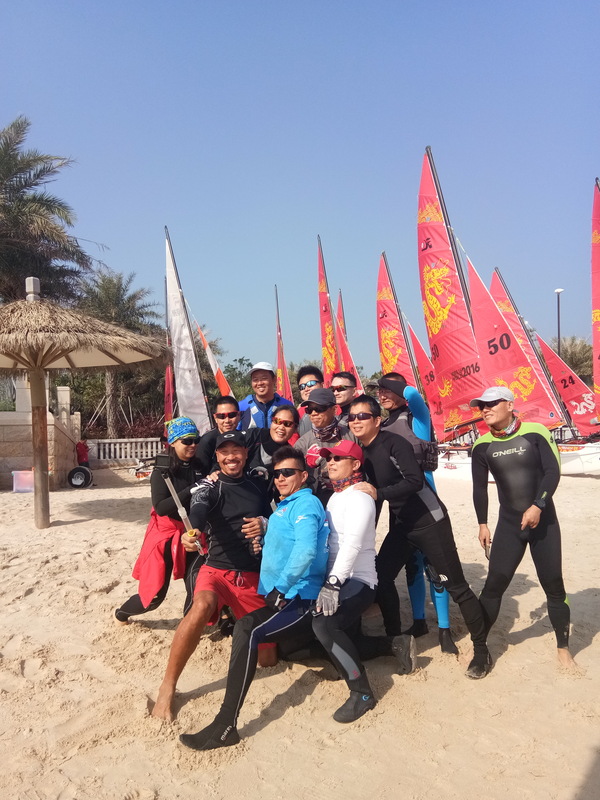 As all patiently waited for the breeze to arrive it finally did. 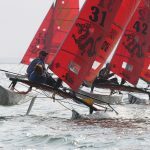 Off the beach and out for a steady 5-7 knot race. 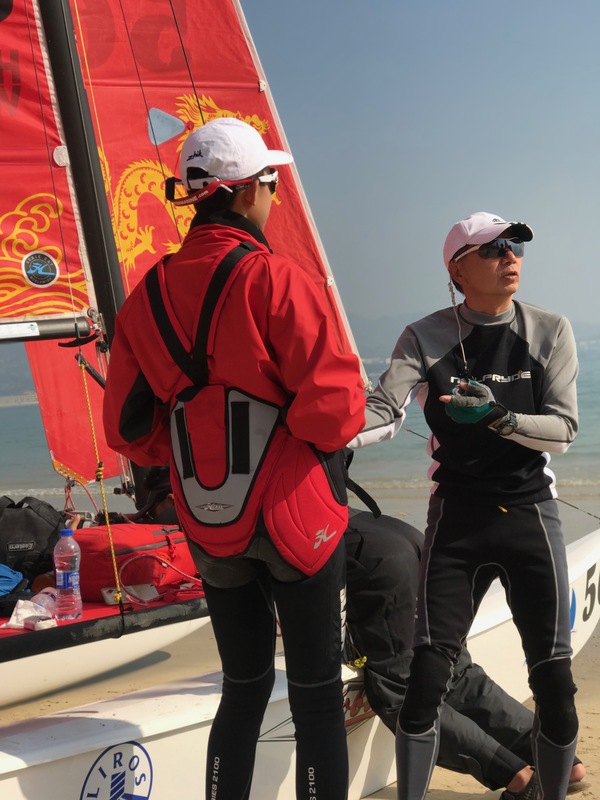 Damrongsak and Aun Vongtim had been on fire all regatta But Teerapong Watiboonruang and Nutpatsorn showed the Vongtim brothers there stern and kept sailing away for a big lead. 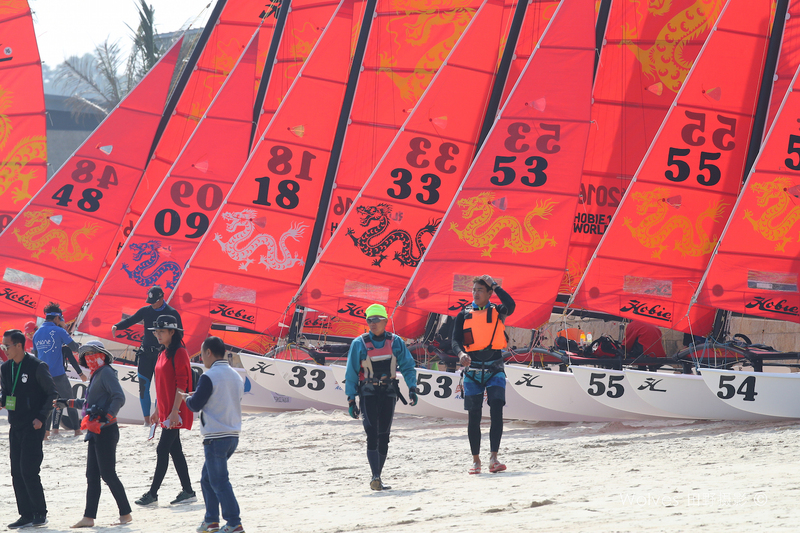 On the second race again Teerapong Watiboonruang and Nutpatsorn jumped to the lead after Damrongsak and Aun Vongtim had a terrible start. 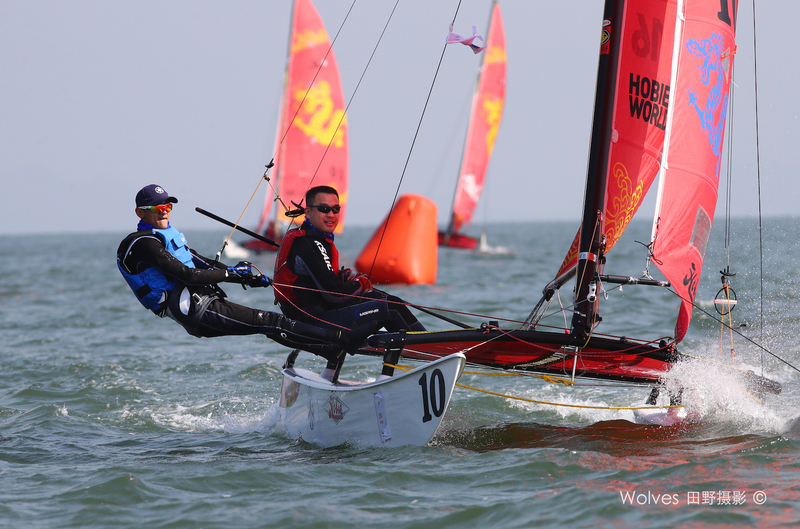 Damrongsak and Aun Vongtim fought their way back to second place. 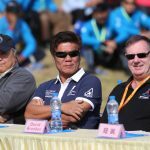 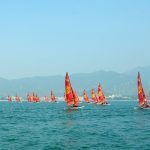 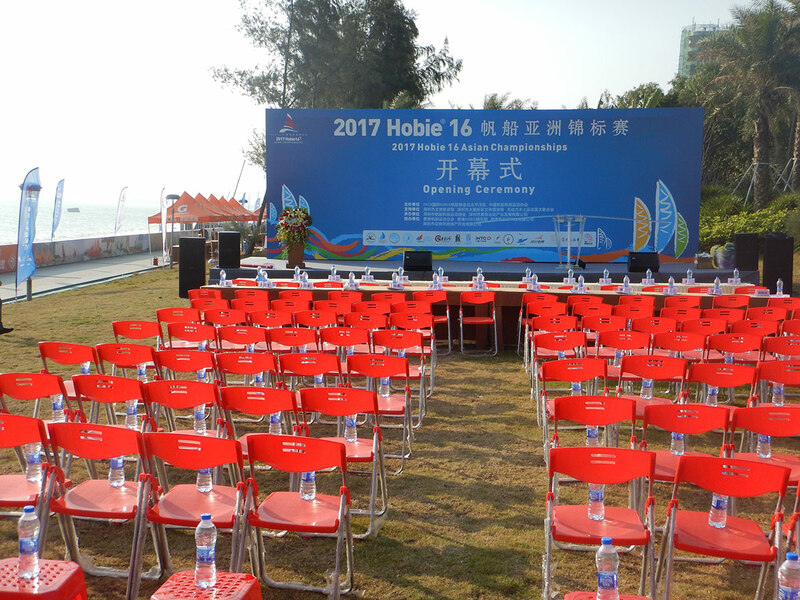 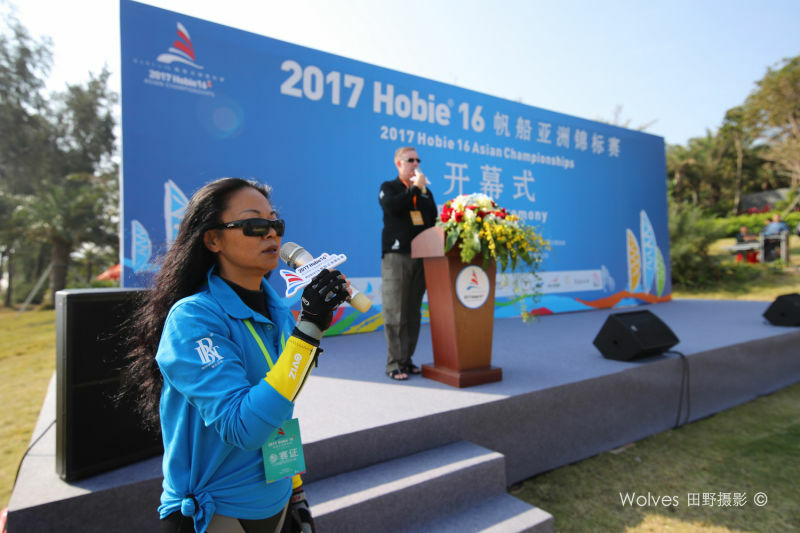 With the breezing dying and the race committee out of time the 2017 Hobie Asian Championships came to an end. 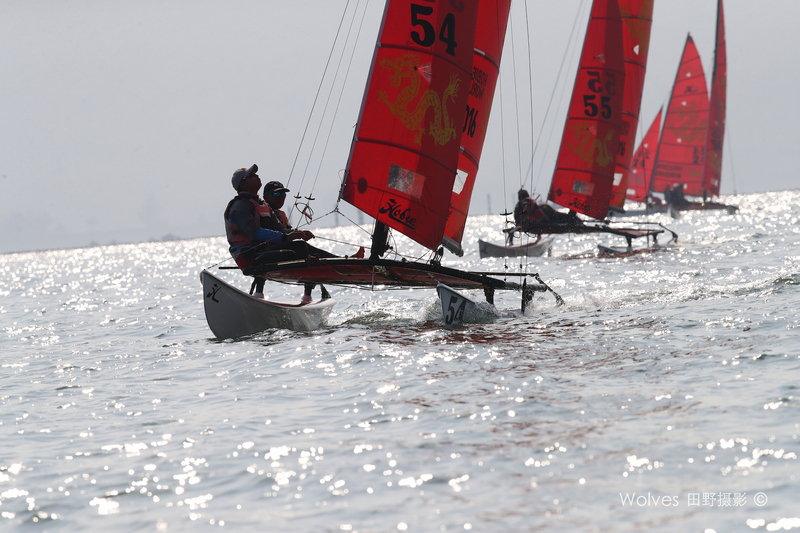 The sailors all enjoyed themselves on the water with testing conditions to moderate and light racing. 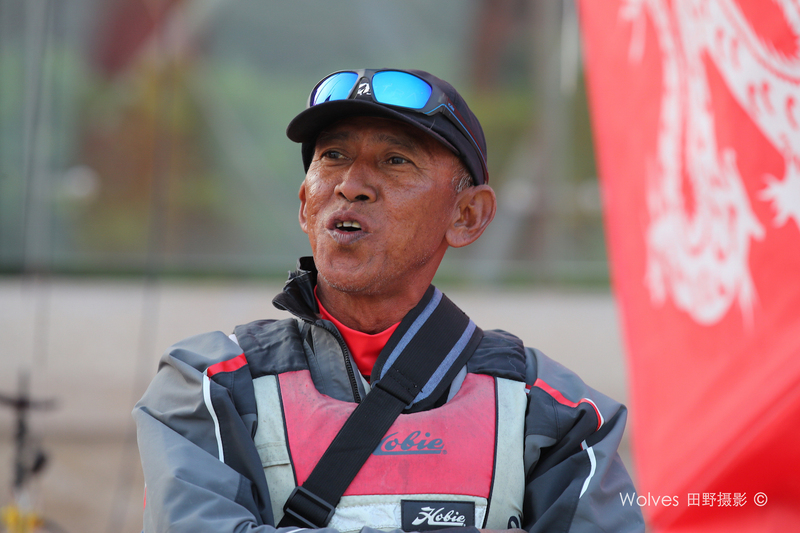 Damrongsak and Aun Vongtim THA proved to be true champions with 7 wins and 3 second places. 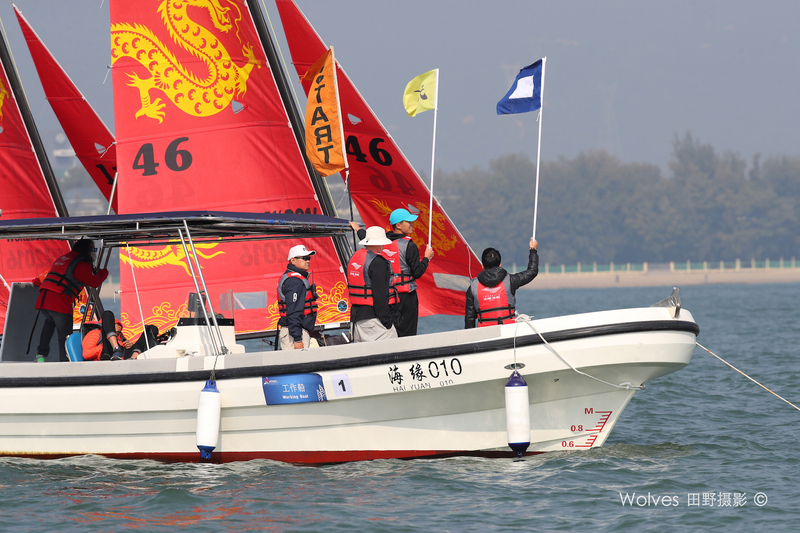 Teerapong Watiboonruang and Nutpatsorn kept them honest winning 3 races with 6 seconds and a 5th pace. 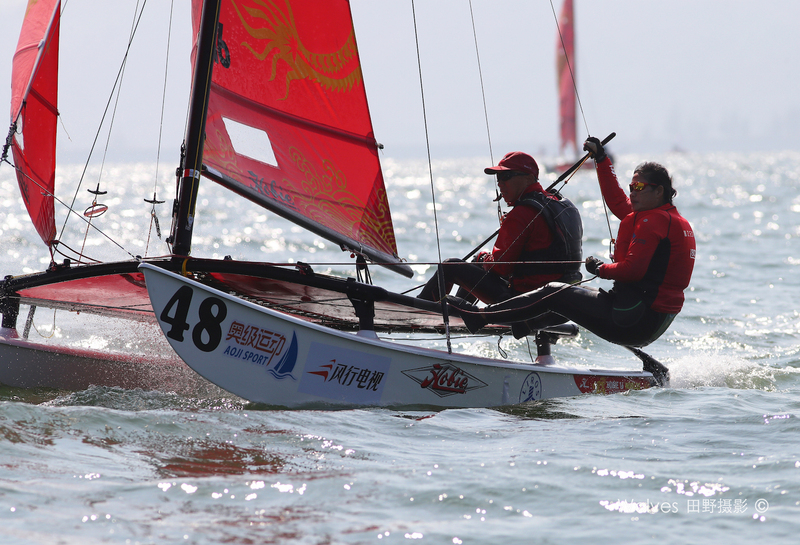 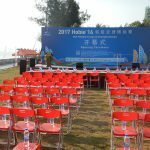 The sponsors with Dapeng and Shenzhen government made the sailors welcome. 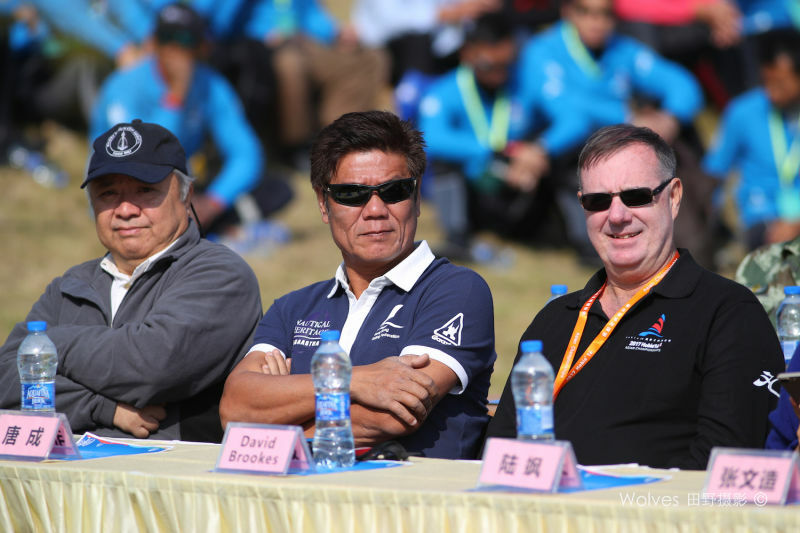 The Chinese Yachting Association provided a wonderful race committee. 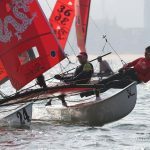 The sailors all want to come back and race again. 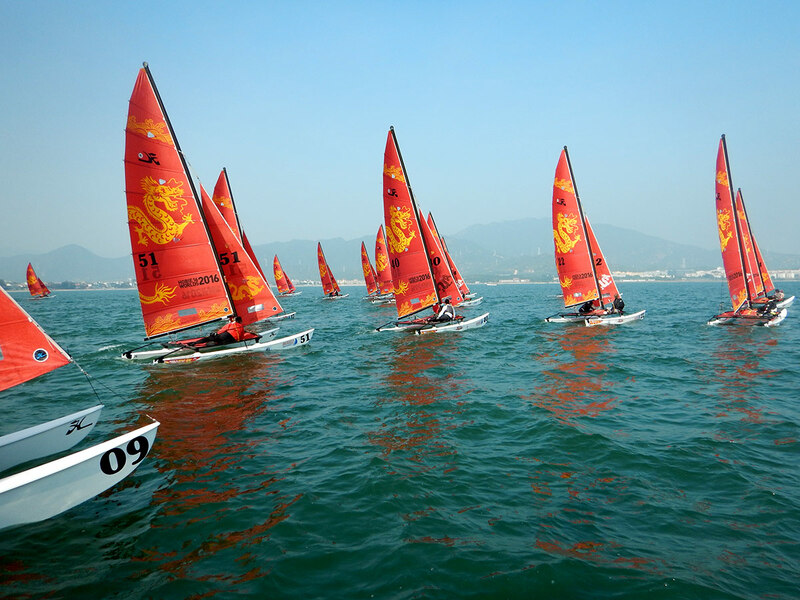 With supplied boats, flat water it made all the sailors wishing the event would never end. 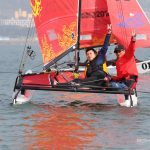 Also the prize money to the winners gave the little bit extra inventive to want to come back in 2018.